Our Columbus JATC represented Sheet Metal Workers Local 24 at a construction career fair in Columbus. The Jan. 26 career fair was an opportunity for Columbus/Central Ohio Building and Construction Trades affiliated unions, such as Sheet Metal Workers Local 24, to reach out directly to potential apprentice candidates. Sheet Metal Local 24 journeymen help students build a metal toolbox at the Columbus/Central Ohio Building and Construction Trades Council construction career fair. Many of the unions represented at the event offered a hands-on demonstration of the work they do in order to help give attendees an idea of the work they could do on the jobsite. 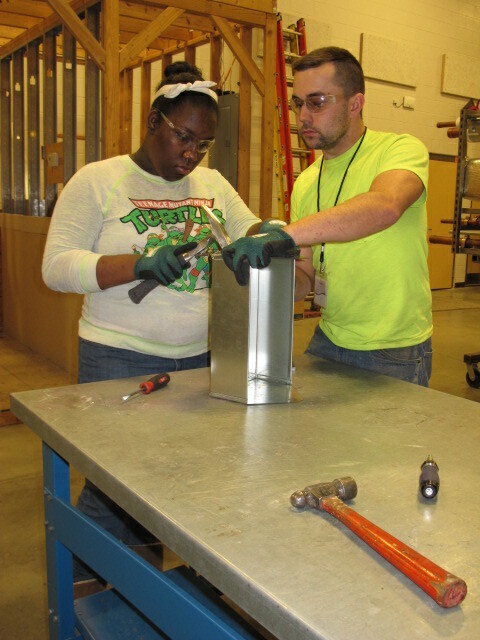 SMW 24 volunteers helped attendees build a toolbox out of sheet metal. Gartner, who also helped coordinate the event, called the hands-on demonstrations the key to the event’s success because it gave journeymen a chance to have a real conversation with attendees. “This setting gave us a chance for conversations, not just the typical job fair run through,” he said. Besides getting the opportunity to build a toolbox, attendees also learned about the Sheet Metal industry’s growing need for workers and were introduced to the apprenticeship model. Gartner felt the overall idea of an apprenticeship was appealing to many parents and students. The hands-on demonstrations allowed Sheet Metal Workers Local 24 members to talk about the potential opportunities within the Sheet Metal Industry. For Gartner, this was a chance to directly talk to students who have not made up their minds about their future. “It is critical that we reach out to students in high school or even younger to explain skilled trades so they can know the possibilities and opportunities that are available. We need to recruit and train a diverse workforce that will build our hospitals, schools and buildings of the future,” Gartner said. “In the past, the skilled trades were passed down from generation to generation and many people did not know how to get into an apprenticeship. Career fairs like this are a great way to open the pathway for anyone that may have an interest. Anyone can go to our website and find out about our program, but this career fair gave me a chance to tell people our story and why they could be a good fit,” he said.